Today, the boys wanted to hike, so I decided on a trail that I have not done in a while at a different section of Avalon Park. We parked off of the Shep Jones Road and started to run on a semi-muddy root filled hilly path around the grounds. 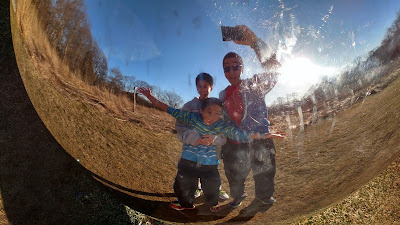 We found this metallic sphere that seemed out of place in the park. As we approached the 4 foot diameter sphere, there was a slot and it turned out to be an opening that we can drop a note to Heaven. Cielo, the Spanish word for ‘sky,’ can also mean “heaven” or “paradise.” Alicia Framis’ Cartas al Cielo is a participatory sculpture that serves as a vessel of communication with those who have no earthbound address. Park visitors are encouraged to send missives to those with no earthly address via this poetic postbox, and so we took the postcards that were provided and used the little pencils to write a letter. It's always fun to run with the boys, and the adventures lead us to something new!